Srinagar: Authorities imposed restrictions in parts of Srinagar to maintain law and order in view of the strike called by separatist groups on the 6th death anniversary of Parliament attack convict Afzal Guru. The sixth death anniversary of Mohammad Afzal Guru falls on Saturday as he was secretly hanged and buried inside Tihar jail on this day in 2013. Afzal Guru, who was hailing from Doabgah Sopore in north Kashmir’s Baramulla district, was hanged on 9 February 2013 after he was convicted for his role in the 2001 Parliament attack. 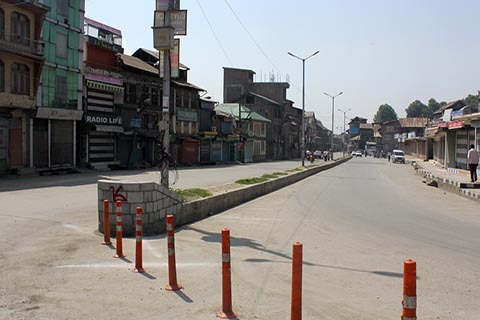 Restrictions have been imposed in six police station areas of Srinagar city. The curbs on assembly of people were put in place in the police station areas of Nowhatta, Khanyar, Rainawari, Safakadal and Maharaj Gunj in downtown (interior) areas and in Maisuma in Srinagar. The police official said the restrictions were imposed to maintain law and order. Meanwhile, day-to-day life was affected due to the strike called by separatist groups, including both factions of Hurriyat Conference and Jammu Kashmir Liberation Front, to protest Guru’s hanging.